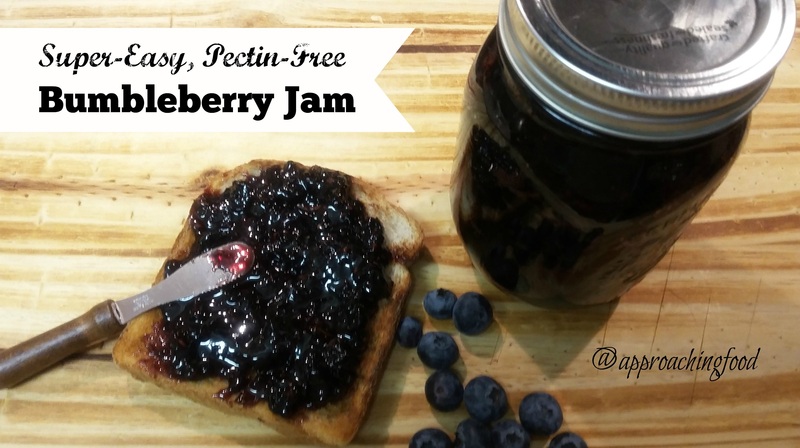 Super-Easy & Pectin-Free Bumbleberry Jam! Bumbleberry jam goes great on toast! 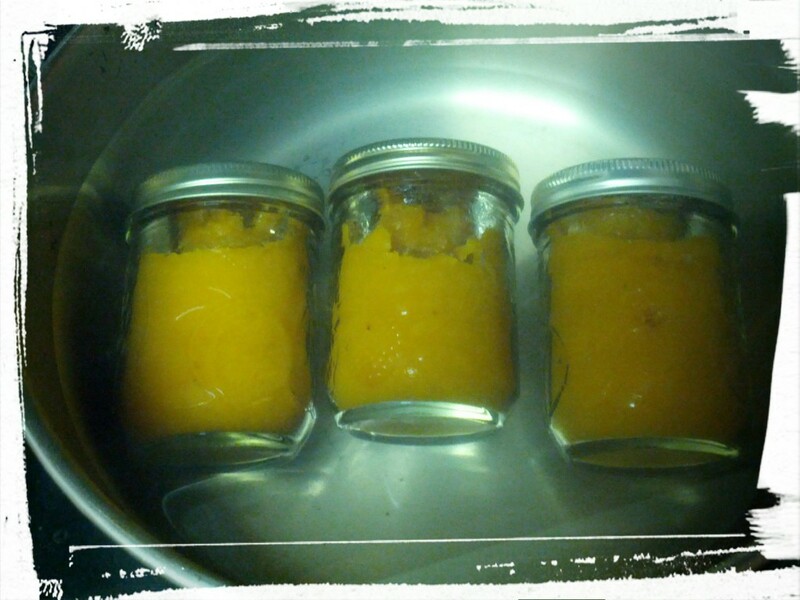 Ever since I figured out how to make jam, I’ve been making batch after batch of fruit jam. Why? Because homemade jam tastes WORLDS different from any store-bought jam! It’s just packed so full of flavour, that you don’t feel like you’re eating jellified sugar as with some packaged jam — homemade jam is worth the VERY small amount of time it takes to make. And you don’t even have to decide on one fruit; you can mix up a number of berries and make Bumbleberry Jam! I’m mixing up blueberries and blackberries today, to make my own version of bumbleberry jam. And, to make it even easier, I’m leaving out the pectin too. All you really need to make this jam is berries, sugar, and a dash of lemon juice! (Not even water.) I like to make pectin-free jam as it’s one less packaged thing I need to add to my food (I told you I was a hippie-in-the-making!). It does result in a slightly looser-set jam, but I’m quite ok with that. 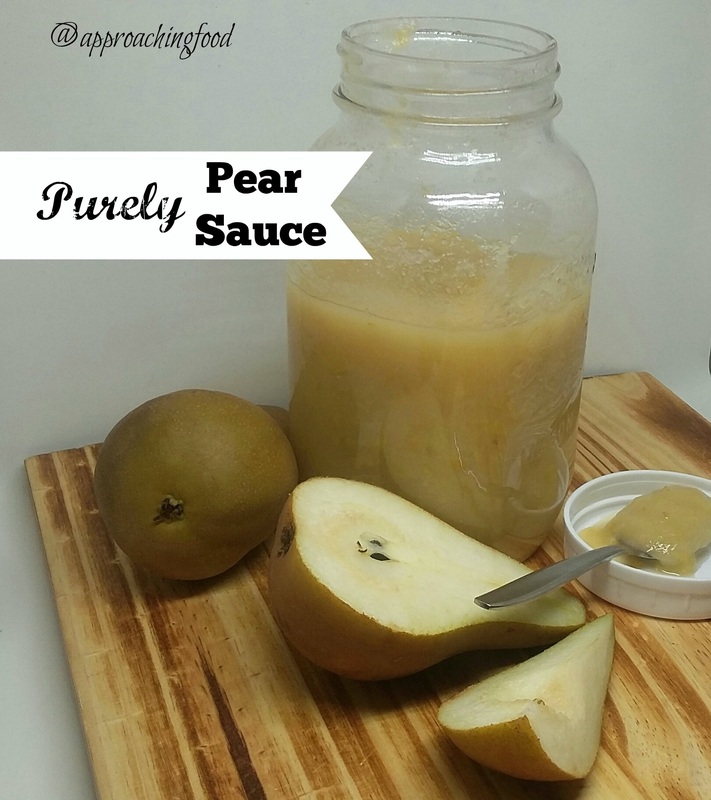 You could also add fruit pectin via apple cores (I use this when making apple jelly) or lemon seeds (I have still to use this tip) but it’s also quite ok to leave out the pectin entirely; you just have to the berry and sugar mixture to a jammy stage (I’ll explain more on this later). Let’s get to making us some homemade jam! 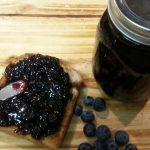 This berry jam contains only a few ingredients, and is easy to spread on toast or to mix in with yoghurt. Mix all ingredients together and place over medium heat. As the sugar melts and the juices of the berries are drawn out, mash the berries so that only some whole berries are left. As the mixture becomes more liquid, bring to a boil, and keep at a boil. When the mixture reaches the "set" or "sheeting" stage (see below for more info), remove from heat and pour into a sterilized glass jar. 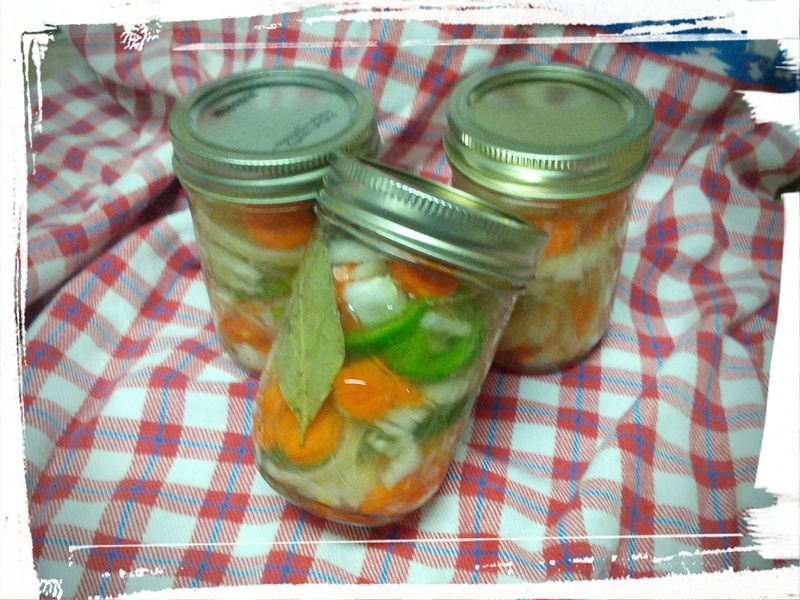 Let cool, and store in fridge. Will keep for a few weeks. Enjoy it spread on toast! I mentioned about how you need to boil the mixture until it reaches a jammy state. When that happens, you can safely say that your jam will have ‘a good set’; in other words, it will be jam-like, instead of a runny sauce. How to know when it has reached this stage? Place a small dish in the freezer. Pour a small spoon of the hot jam mixture onto the plate. Swipe your finger through the mixture. Does the jam run together to become one blob again, or does it stay separated into two blobs? If it doesn’t run together again, then it’s a good set! Another way to measure if a jam will have a good set, is to take a wooden spoon and let the jam mixture run off the side. Does it run off in several rivulets? Not done. Does it run off in one thick drip? Then it’s “sheeting”, and it’s going to have a good set! One warning: better to undercook than overcook. This particular jam (with blackberries) tends to be prone to caramelizing, so again, better to undercook than overcook. A slightly saucy jam is better than a solid lump of candied berries! FYI, you can always save an overcooked jam — just heat it in the microwave, add a bit of water, stir, and you’ll have a looser jam (perhaps not properly set, but good enough to spread on toast!). You might look at this recipe and think, wow, that’s a lot of sugar! Don’t worry, it won’t over-power the flavour of the jam at all. I usually use the 1-1 rule (1 c. berries to 1 c. sugar) when making berry jams (especially strawberry jam), mostly because I use them to stir into my morning yoghurt to make homemade fruit yoghurt (topped with homemade granola, of course!). 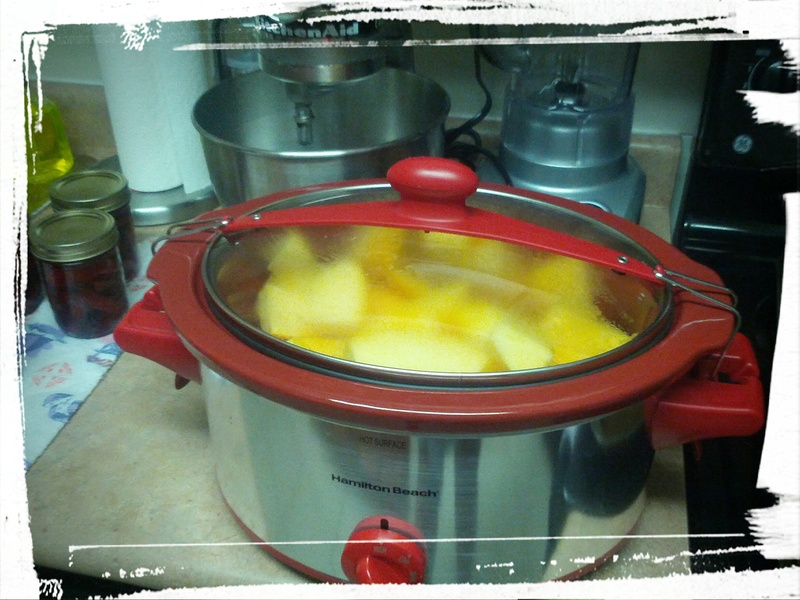 You can use less…but it won’t taste as good and it won’t set as much (lots of sugar in integral to get jam to thicken. Not enough sugar and you’ll end up with berry sauce). While normally, I’m all for making a recipe healthier, I suggest trying this one as is before trying to reduce the sugar. Even if (and I don’t think this will happen!) you didn’t like it, ANYONE you know will be happy to eat your homemade jam! As I said, I like to use this jam to stir into my morning yoghurt, but it’s equally delicious on toast, or between cake layers, or to top a jammy cookie (make a pie crust, cut into cookie-sized circles, top with jam, and then top with crumble topping. Bake, and enjoy!). Let me know how you end up using this delicious jam! Next Post: I’m working on fine-tuning my Best Ever Macaroni Salad. I thought I had gotten the details right, but then it mysteriously disappeared from the fridge when I got up to snack on it at midnight. The DH had a slightly guilty but satisfied look on his face, so I take it that the recipe is a hit! This entry was posted in Preserves on May 14, 2018 by Margaret. Pour it out or spread it on! I love homemade cranberry sauce! Growing up, my father was the one who made the cranberry sauce for Thanksgiving holidays, using only cranberries, sugar and water. My mother doesn’t like cranberry seeds in her sauce, so he has always been careful to sieve them out of the finished product. Love is in the little things sometimes, yes? Personally, I don’t care if there are seeds in my cranberry sauce. Or skins, for that matter. Makes it SO much easier to make! How much easier? Well, let me tell you! So. Easy. You literally dump the ingredients in a pot, boil for 20 minutes, blend with an immersion blender, and bam, sauce! High in vitamin C, plus the added benefit of the fibre from the skins. If you’ve only ever had store-bought cranberry sauce, try this recipe — it’ll make you a believer in scratch cooking! 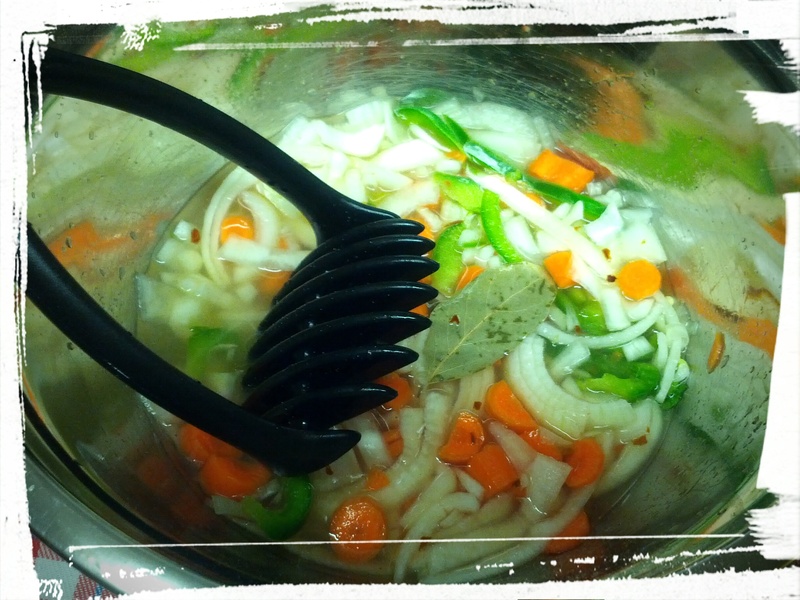 Dump all the ingredients in a pot and heat over medium heat for 20 minutes, stirring occasionally. When the pot boils and becomes frothy, all the berries will have been cooked and will have split open. Remove from heat and blend using an immersion blender. Let cool — it will gel as it cools. Serve as a side with meat, or on toast points for brekkie! You actually can leave out the lemon juice if you want, and reduce the sugar slightly, but I find the lemon adds a nice note. You could probably even stir in some lemon zest for a lemony tang. Or chunks of cooked apple for a cran-apple sauce. The possibilities are pretty endless! If you do add in a mix-in, leave a comment and tell us what you did; I’d love to hear! 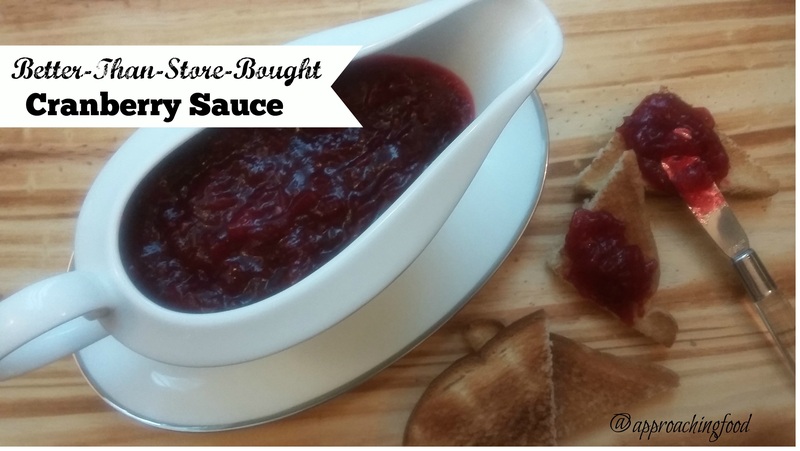 This sauce will last for at least a week in the fridge, so it can be made beforehand, but fair warning, it disappears pretty quickly when people realize it can be used as jam! So I recommend on doubling the quantity, at the very least! Next Post: Either Pumpkin Gnocchi or fancy Drunken Cupcakes (with Bailey’s Irish Cream). Add in a salad and a glass of something you fancy and you’ve got yourself a date night special! This entry was posted in Preserves on November 5, 2017 by Margaret. That’s right, I’m in the middle of making my own pumpkin pie, from scratch! 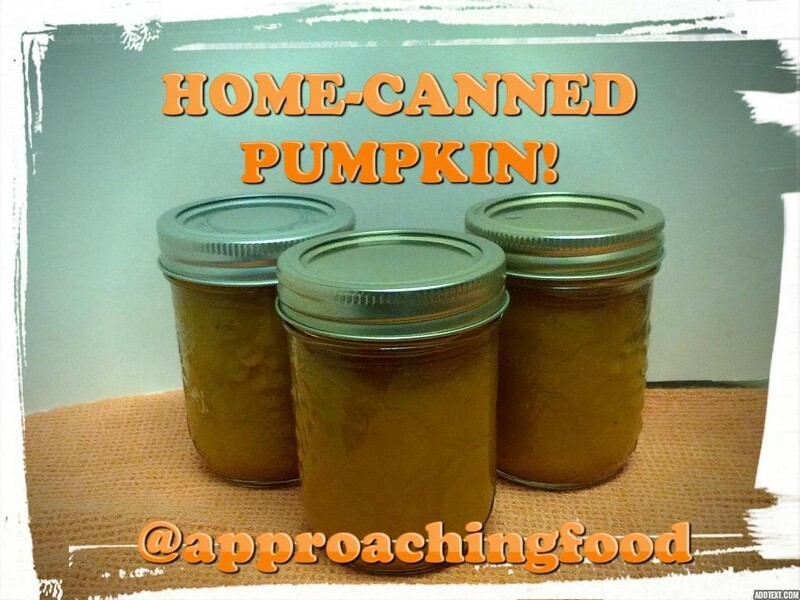 I’ll share with you in a later post about the pumpkin pie, but here’s how to can your own pumpkin. No preservatives, no added anything, just pure pumpkin! Firstly, you need a pumpkin. I got this one when I went apple-picking with my family a couple of weeks ago. 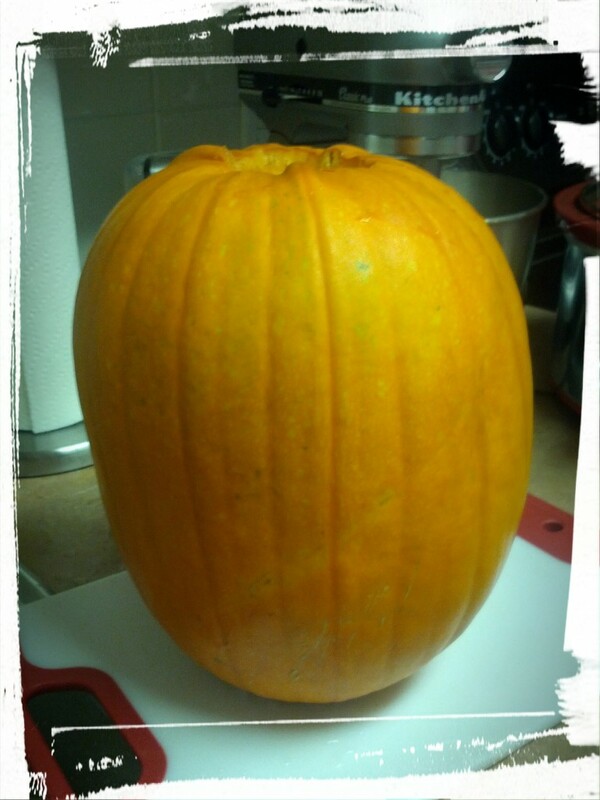 It was either going to be a jack-o-lantern or a pumpkin pie, and my tummy won the debate. The pumpkin. I’ve heard that sugar pumpkins are good, but I just picked up one that wasn’t expensive and looked cute. Meh. Good enough! You’ll also need a slow-cooker. Most people have one tucked away somewhere, otherwise they’re super-cheap on Craigslist. Halve, and scoop out the seeds. Reserve those seeds for roasting. Cut of the top of the pumpkin. Scoop out the seeds and reserve for roasting. Scrape the insides of the pumpkin until no more gooey innards remain. 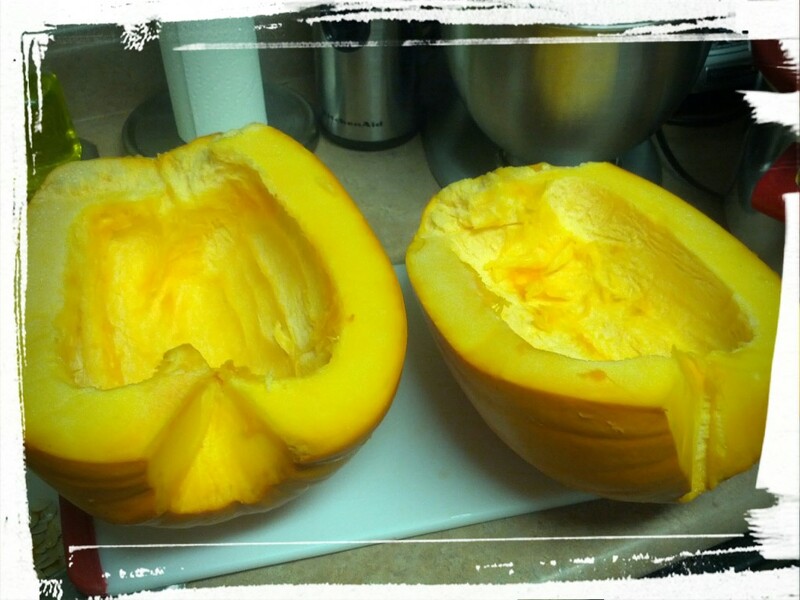 Peel outside of pumpkin. Chop into small chunks. Place 1/2 the pumpkin in the slow cooker (it’ll likely take two batches to use up the entire pumpkin) with about 1 c. of water. Cook on high for about 8 hours, stirring every two hours. Once soft when pricked with a fork, blend using an immersion blender. Then, it’s ready to can! Chop into pieces, and pop into the cooker, with some water. And yes, those are some pickled beets that you see cooling in the corner. My mum told me I was “a real farmer’s wife”! Incidentally, I live in the city. I’ve got my second batch of pumpkin in my slow cooker now, and the simmering pumpkin is making my home smell like pumpkin pie. 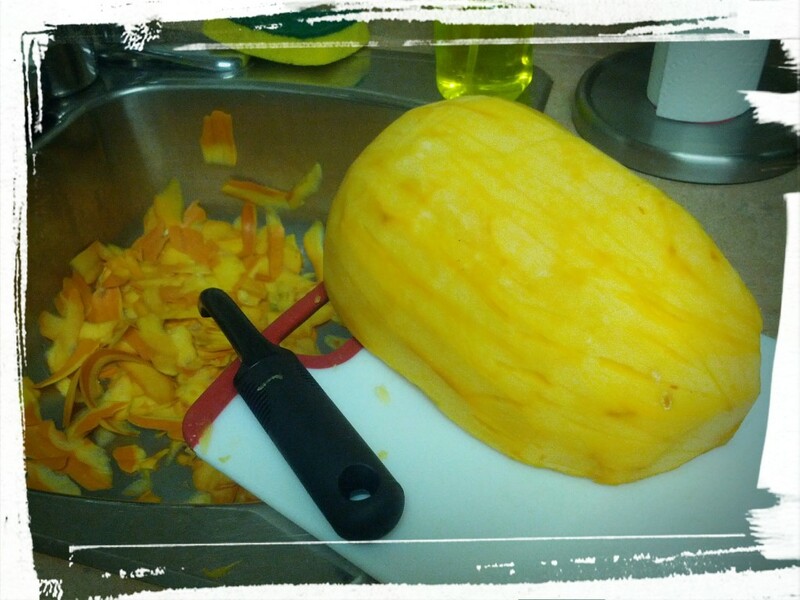 I hadn’t realized that pumpkin, by itself and without any spices, actually has a distinct pumpkin smell. I reallllly want pumpkin pie now! Boil to make sure they heat seal! Next Post: Pumpkin Pie! And how to make it. Plus a fancy braided crust for that uber-Martha look. Bring on the (Canadian) Thanksgiving! This entry was posted in Preserves on October 9, 2015 by Margaret.